When you visit the Louvre, you find there are four main Louvre entrances but they are not all equal. One thing that is the same is that all the entrances require you to go through security. After security, if you have your ticket you can proceed to the various wings. If you don’t have your ticket, you’ll need to get in line again to buy your ticket either at the self-serve ticket kiosk or at the ticket window. One thing to remember is this is Paris and things can change without notice and then change back again. That said, let me breakdown the four Louvre entrances. I.M. Pei Pyramid. The main Louvre entrance and the most popular is at the I.M. Pei Pyramid. There are two lines: one for those who do not have tickets and one for those with tickets. You do NOT want to get stuck waiting in the line without tickets. You’ll be there for hours and that is the line just to get through security. There will be another much shorter line, if a line at all, for those with tickets (look for the sign “avec billet” meaning with tickets). The arrow below indicates where the “avec billet” line starts. You can see, that queue is a short straight line. Basically, both lines feed into the same security checkpoint, only if you have a ticket, you get through security before those with no tickets. Learn how easy it is to get your Louvre entrance tickets when you are in Paris here. Arrow indicates where the “avec billet” line starts. Porte des Lions entrance. The thing about this entrance is that it is only open at certain times and you may find that even during those certain hours, it may be closed. This is Paris after all and break time can happen at anytime. Due to the uncertainty of its opening, you are likely better off using the I.M Pei entrance if you already have your ticket – and there is no reason for you not to have your ticket if you followed my advice. However, it is only a short walk from the I.M Pei entrance, so you won’t be out much time if you decide to try it out. Look for the first set of Lions (closest to the I.M Pei Pyramid). The second set is the Ecole du Louvre, a school (closest to the Tuileries garden). Entrance at the inverted pyramid in the Carrousel du Louvre. Again, the painfully long line will be for those without tickets. And, once again, it is the line just to get through security. The main difference at this entrance is that the short line is usually reserved for those entering with a tour group. Be sure to check before you queue up because you don’t want to get in line with those who don’t have tickets. If they are using this entrance for tour groups, they will direct you to the main entrance at the I.M Pei Pyramid. Don’t let the picture fool you, museum had closed so there was no line at the inverted pyramid entrance. Passage Richelieu. This entrance is for those with Louvre Museum memberships and tour groups. But, it is definitely an area to check out so you can see the window overlooking the sculpture garden. Window overlooking the sculpture garden in the Passage Richelieu. What entrance do I recommend? I recommend you buy your ticket ahead of time and then enter through the I.M. Pei Pyramid via the “avec billet” line. Not what you expected, huh?! I know, everyone else seems to suggest another entrance but if you get your ticket ahead of time, the I.M. Pei entrance is really the most direct way in. The biggest issue most people have with the I.M. Pei entrance is the long lines but having your ticket means you get to stroll right by. What about you, which entrance do you use? 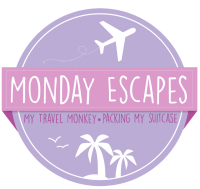 This post is part of Monday Escapes hosted by My Travel Monkey and Packing My Suitcase. I got my ticket at the tourist office just down the street on rue Pyrenees. It cost an extra 1.50 euro but didn’t mind. I was riding past the tourist office on my bike a few days before going to the Louvre. They also sell other museum tickets. Yes Isabella that is another option. I wrote a blog post about the Paris Tourist Office and all the reason to stop and check it out. I used to use the Carrousel entrance when I lived in Paris, but that was 8 years ago and as you say, things change often. One tip I would add is that if you have a child still using a stroller, make the most of it. Families with kids in strollers get waved to the front of the queue. We continued to use our stroller for a while after our kid had stopped really using it just for this reason, and then when he flagged later he could jump in! That is great tip for families! My grandmother used to do the same thing with her cane back when she didn’t really need it. FANTASTIC! I love the Louvre. I have a few other posts about the museum you might find helpful too. Just search “Louvre”. Thanks for visiting! What a useful post Kimberly!! I wish I knew all this before the 3 times I have been to the Louvre and had to stand in line 🙁 well, now I know and can pass on the information thanks to you! I wish you a great week!! Thanks! Now the next time you’ll know what to do! The key is having your ticket ahead of time. A real time saver! There are actually more entrances but the four are the main ones for visitors. Definitely get your ticket early. The key to it all.